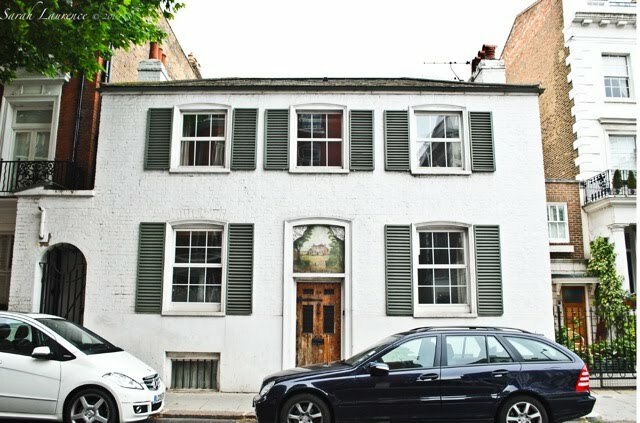 Walking up Drayton Gardens, a residential road in London, we saw a little house, wedged between townhouses. 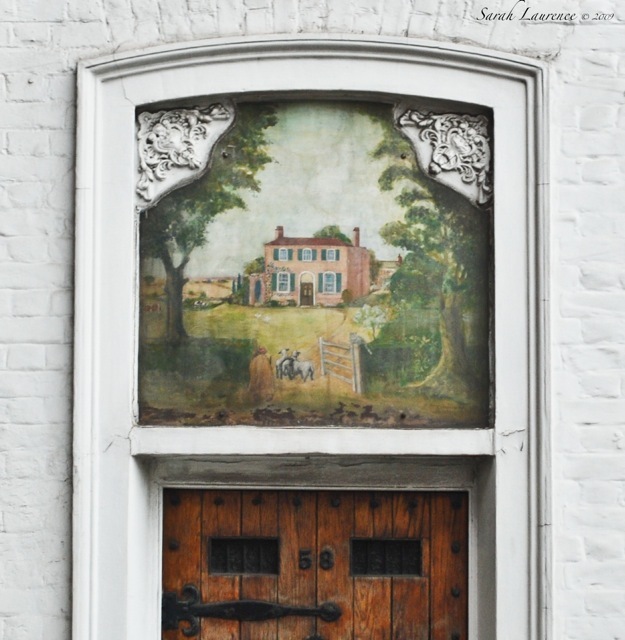 Above the ancient door was a mural of the house’s pastoral grandeur. Like the shepherd at the gate, I stopped in my tracks. Tears welled up in my eyes. 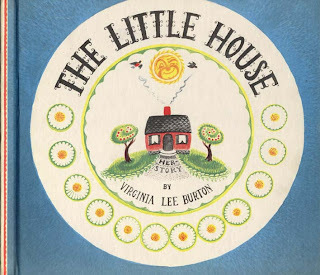 Growing up in Manhattan, one of my favorite books was The Little House by Virginia Lee Burton. My father saved it from his childhood collection. He would have been 6 and living in Manhattan too when it was released in 1942. Sadly that first edition book did not survive my children. I cried the day I found the yellowed pages scattered in the nursery. I replaced it and supervised picture book reading after that. The Little House is an American tale of a small pink house in the country. She sees the distant lights of the city and wonders what it would be like to live there. Over the years, the city sprawls towards her. Abandoned by the family who built her, she grows derelict and is trapped between skyscrapers, no longer able to see the stars at all. 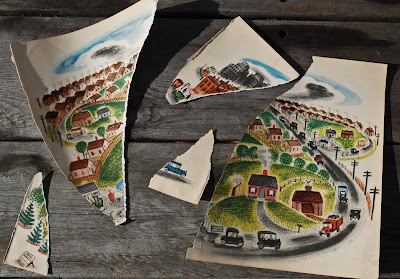 The Little House was published in 1942, but the story feels like a current tale of urban sprawl. Burton’s gorgeous illustrations remind me of another favorite artist, Grandma Moses. Her words are both poetic and visionary. The Little House won the Caldecott Medal in 1943. 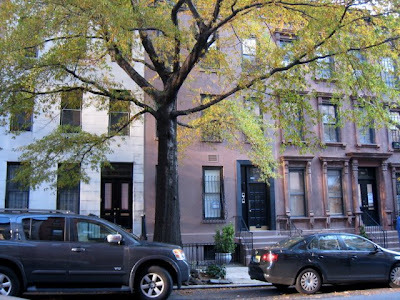 Back in the 1970s, my family lived in a brownstone in a vanishing neighborhood of low-rise buildings. The old wood frame building next door, one of the last remaining in the city, was torn down to build a “pencil building” before laws banned them. Pencil buildings were mini-apartment buildings, built on a single lot. On the avenues, rows of century old townhouses were razed to build luxury condominium high-rises. The Old World feeling of Yorkville became Upper East Side posh. Today there are no more children playing unattended on the sidewalks. Brownstones remain midblock, wedged between huge apartment buildings. Virginia Lee Burton passed away in 1968, when I was just learning how to turn pages without tearing them. Burton’s picture books are still in print today through Houghton Mifflin. The Little House would make a special holiday gift for your child or grandchild. Of the many books I passed onto other children when mine got older, this one remains on my shelf and in my heart. Do you have a favorite picture book from your childhood? Book Award Watch: Tonight is the National Book Award. 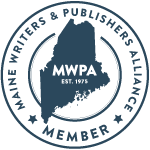 I'm rooting for Maine author Phillip Hoose. Claudette Colvin: Twice Towards Justice tells the true story of a teenaged girl who refused to give her seat to a white woman on the bus. Colvin was jailed 9 months before Rosa Parks and went on to testify in court against segregation. Hoose interviewed Colvin to tell this true heroic tale, for the first time giving it the attention it deserves. Hoose's guest tonight is Colvin. I dare you to watch the video above with dry eyes. Update: Phillip Hoose won the National Book Award for Young People's Literature - congratulations! Shakespeare Watch: the Brunswick High School in Maine is performing Much Ado About Nothing on Thursday, Friday and Saturday nights at 7pm and 2pm matinee on Saturday. In addition to a ticket, bring one item of non-perishable food to contribute to the food drive. Ten percent of ticket sales are also going towards the hunger drive, once costume costs are paid. The kids are doing a great job with this delightful romantic comedy. I've been observing rehearsals to research my young adult novel as u like it. Aw, so sad your book was torn up. I know your feelings exactly. When I was a child books were magical! I still have all of mine from my childhood. They survived fairly intact the trials and tribulations of my children. I could not imagine losing a favored book. I've not read this one but it is great the little house is with you now. What a lovely account of houses, homes and the stories they hold. No wonder you teared up when you saw that door and painting on your travels. Our structures are not inanimate. Thank-You for sharing this part of you childhood with us and your pictures. I love to give books to children for birthdays and Christmas--what could be a better gift? My favorite books growing up were: Make way for Ducklings and One Morning in Maine. I remember checking these books out of my elementary school libray and they went everywhere with me. Tina, I loved hearing that you saved your childhood books too. The rest of my collection survived, and it was my fault for leaving such a cherished book alone in a room with a toddler, who was refusing to nap. My children now love books and are very careful with them. Bonnie, how right you are! We do become emotionally attached to our homes, both physical and literary. Tracy, I grew up with Make Way for Ducklings too and saved it. My son loved to visit the duckling sculptures in the Boston Public Gardens, based on the book, another Caldecott Medal winner. I only read One Morning in Maine after moving there with my children. Blueberries for Sal was another favorite of mine and my kids. We pick blueberries every summer but haven’t seen any bears. Robert McCloskey is brilliant. It’s fun to be raising kids in his backyard, picture book country. It was extremely interesting for me to read this blog. Thanx for it. I like such themes and everything connected to this matter. I would like to read more soon. What a lovely storybook. I've never heard of it, but now I want to go get it. That mural on that home is definitely a tearjerker. So wonderful and sad that change came and changed that home. Anonymous, welcome to my blog and thank you. Alyson, I think you’d like the art and your youngest son would enjoy the story. It’s the primitive American style that your painter friend uses. The author was a New Englander too. I adored this post. It brought back memories galore. I loved the symbolism of the city advancing towards the house, economic development swallowing up rural settings. And I'm sorry your book did not survive your children's early age. Many thanks for your fascinating post. ACIL, I was struck by how timeless this tale was. I enjoyed your latest Zadie Smith post too. I had two seemingly disparate favorite picture books growing up. One was the Golden Book of Bible Stories that had very graphic pictures of Noah's Arc, Daniel in the Lion's Den, David and Goliath, etc... I also had a collection of children's science encyclopedias. These showed life emerging from the mud, evolving in the oceans and had lots of fighting dinosaurs with complete with flesh between their teeth. Les, I grew up with a Golden Bible too. The illustrations were fabulous. I love how you paired the Bible and a book on evolution. You sound a lot like me at that age, asking questions. I was so disappointed to learn as an adult that the brontosaurus was a mistake. All of my childhood books were lost in a fire that gutted our home/gallery some years ago. And for some reason, I struggle to remember the titles...maybe it is because I don't want to...reading this post reminds of the pure joy of connecting with loves that appear to have been lost. It is beautiful. Congrats to Hoose. I am glad more will be able to learn of the courageous teenager who said "history had me glued to the seat"
I don't remember reading Burton's book but will look for it to read with Micah. He is finally able to sit in my lap and enjoy a book with me, especially one with great illustrations. Looks like this one would keep his interest. My older sister got dibs on the collection of books we all shared while growing up, but I recently claimed my dad's collection of classics by Black's Readers Service Company. The covers and pages have faded, but the memories of reading them years ago are still vivid every time I open one now. Thanks for this lovely post, Sarah! Oh, I must get this book! I can't think of a picture book off hand that I loved... but I just finished "The Enchanted Castle" and it was charming! MS, it was such a tragedy to lose a childhood of memories in a fire, not to mention all the art. I can’t imagine how horrible it was to see it all go up in flames, to lose so much. Perhaps you shall retell those stories in your own writing. I’m thrilled that Hoose won and that more young readers will learn about Claudette Colvin; she’s living history. W2W, picture books are such a generational thing. We inherit the books from our parents, but those books can miss the in between generations. My children’s writer friends in Maine, who aren’t that much older, hadn’t heard of many of my favorites. It must be a joy reading to a grandchild. I’ve passed most of kids’ books onto my younger brother for his kids, but some I couldn’t bear to part from. Also they are being raised Japanese in the US until first grade, so those first books would be counterproductive. JaPRA, you’d love The Little House. The Enchanted Castle makes me suspect you are missing England. Fiction can transport you. I enjoyed this post so much. I've now added "The Little House" to the list of books to get for my son. I adore children's books! Two of my favorites when I was young were "Where the Wild Things Are" and "The Terrible Thing That Happened at Our House." I can't remember the author of that one right now, but I still have my well-worn copy! My childhood books are some of my most treasured possessions. Donna, Where the Wild Things Are was my son’s favorite. You are reminding me that I still haven’t seen the movie. I haven’t heard of “The Terrible Thing That Happened in Our House,” but it looks like it follows the theme of disorder. Thanks for sharing. Incredible to think that London grew around that little house! (I'm feeling like that myself, with neighbors on both sides continuing to encroach on the property boundaries of our old barn.) I wonder when that mural was put up? And who lives there now? I'm familiar with Burton because of Mike Mulligan and the Steam Shovel, but I don't know this book. I'd love to have a vintage copy of it. When I was a child, one of my favorites (handed down by my mother) was Ruth Sawyer's Roller Skates. It, too, takes place in New York City. Today, I read A Bargain for Frances by Russell Hoban to one of my students. (This book was one of my childhood favorites.) Nothing better than handing down cherished stories. Bee, it was a reminder that London used to be a series of villages. We stumbled on this house by chance, and I wish I knew its true story. My brother loved the Steam Shovel books. A Bargain for Francis was one of my favorites too. My daughter liked it too. It’s good to hear that you are sharing the book with more kids. I have a big fat green fairy tale book that was my absolute favourite when I was little. It has a place of honour now on the bookshelf that surrounds the dining room. How wonderful to actually see The Little House!! I can identify with the Little House, more so when abandoned and voices ring no more within. I believe homes become derelict not from age but from lack of voices rebounding off walls. It is on their hinges that doors relish their lives. With none to turn them out they wither away in anticipation. This reminded me of the Lions at the Gate I posted recently. Lions guarding gates to homes that lie abandoned. I hope you can put the pieces together of the picture book. I've not read the The Little House book. I will now. I would still put those pages together and frame them. Nice story. Rose, you’ll enjoy reading The Little House to your grandson. We live in a 1920’s house that was built to last, much less flimsy than the modern house we lived in back in Massachusetts. How nice that your mother held onto those special books for future generations. Pamela, that’s exactly the type of book I’d imagine you saving. There’s such a magical quality to your blog. Anil, you are right about inhabitants bringing a house to life. Somehow I missed your lion post – I shall come read it soon. Too late tonight. Elenka, I was thinking about framing a less torn page. I’ve saved them for over a decade. Some of my childhood books got ruined in a flood in my mother's basement. It was a horrible feeling of loss. Barrie, how sad! And Mama Shujaa lost all her books (and everything else) in a fire. My parents had a flood in their basement and lost half of our childhood books, but luckily not the oldest ones. It was still so painful. Wow what a wonderful post, Sarah. So sorry about your book. Oh, I loved this book too and still have a copy in MY study--although not my original. I don't know what happened to that. I have a cabinet in my study where I keep my favorite "childhood books"(both from mine and my children's). Keri, somehow it feels better for having blogged about it. Cynthia, that’s so cool that we share The Little House, A.A. Milne, and Harold and The Purple Crayon in common. Harold was a big favorite of mine – it’s such a wonderful treatise on the power of the pen linked to imagination.